Today in our Brandon FL cosmetic dentistry blog we will highlight some of the simple things you can do with your toothbrush to keep your mouth as clean and healthy as possible. One of the most important habits Brandon FL residents can form is to always allow their toothbrush to completely air dry between uses. The best way to let the toothbrush air dry is by placing it in a toothbrush holder on the counter with the bristles pointing up. This method of storage is much better than sticking it away in a drawer since it’s unlikely to dry there. Also, when you travel away from the Brandon FL area, make sure your toothbrush is dry before you seal it away in a travel container. 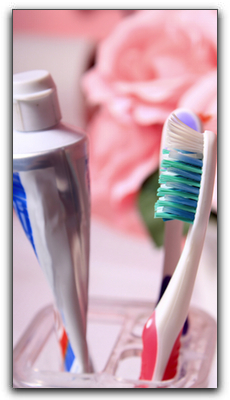 A good strategy for Brandon FL residents to make sure their toothbrush has ample time to dry is to buy two toothbrushes at your local drugstore. Then alternate between the two so each has time to fully dry out between uses. We are currently accepting new dentistry patients and the knowledgeable staff here would be happy to answer any questions you have about teeth whitening, veneers, bonding, or other cosmetic dentistry procedures. We are located at: 3203 Lithia Pinecrest Rd, Valrico, FL 33596. This entry was posted on Wednesday, January 4th, 2012 at 10:53 am	and is filed under Education, General Dentistry. You can follow any responses to this entry through the RSS 2.0 feed. Both comments and pings are currently closed.